Evening - Orientation meeting & dinner. Breakfast with Daniel Pipes and Athos Kyranides of the Thucydides Think Tank. ExploreNicosia (the capital city since the 11th century), including both the Greek and Turkish sides, divided since 1974. Evening: Dinner and a guest speaker, Dr. George Kentas. Topic: "The emerging relationship between Israel and Cyprus in terms of security and international relations"
Breakfast with Daniel Pipes – a casual talk on the current Middle East events concerning Cyprus. Visit to Pyla, one of four villages within the United Nations Buffer Zone and the only settlement in Cyprus inhabited by bothGreek Cypriot and Turkish Cypriot inhabitants. On to the Pierides museum (a private collection of Cypriot antiquities) and the Church of AyiosLazaros built in the 9th century. Evening: Dinner and discussion with Athos Kyranides of the Thucydides Think Tank and Dr. ChristodoulsGiallourides. Topic: "The Turks for now are at bay. For how long?" Explore the Dhekelia Sovereign Base Area occupied in perpetuity by the British military. Discover the Turkish side, including Famagusta (with a walk around the fence at Varosha, the tourist area which has been barricaded off and left to crumble since 1974). Visit the Venetian Walls, part of the old city walls fortified by the Venetian occupiers in the 15th century and the Venetian Palace near the old city wall. Once a city of 650 churches, now most are converted to mosques. Stop at the Lala Mustafa Pasha Mosque in the old city and Othello's Tower, the famous setting of Shakespear’s Othello. Time permitting we will visit Kyrenia, one of Cyprus most picturesque sea towns and ancient fortresses. The KyreniaHarbour is one of the world’s most beautiful harbors. Evening program: Dinner and a Panel discussion with Dr. EleniStarvrou - "The history of the Cyprus – Israeli relationship" and Prof. YiannisMazis - "The new alliance s in the Middle East – A paradigm shift". Visit Kolossi Castle (a Crusader structure from the 13th century), the ancient ruins of Curium, Aphrodite's Rock, and the Byzantine Church of AyiaParaskevi. Continue to the town of Paphos, sometimes referred to as Pafos. This is a coastal city in the southwest of Cyprus and the capital of Paphos District. 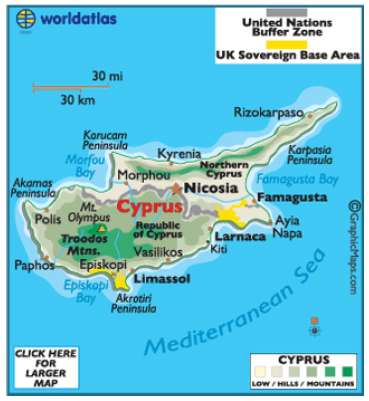 It lies on the Mediterranean coast, about 50 km west of Limassol (the biggest port in island). Visit St. Paul’s Pillar, Paphos Harbor, the House of Dionysos and the Tombs of the Kings. Evening program dinner and a presentation by Dr. Ismael Kemal: "Is Turkey becoming the new regional super power?" Breakfast and a casual talk with Daniel Pipes. Rest of the day for leisure, shopping, beach, and/or exploration on your own. Late afternoon: Wine and cheese on the beach. Evening: Dinner and presentations by Yiannis Vlinakis, former Greece Forign Minister - "The prospects of strategic alliance between Israel Greece and Cyprus" and Eliezer (Moodi) Sandberg, former Israel Energy Minister - "The new oil fields off the coast of Cyprus – a new regional reality". Visit the Troodos mountain range, including Kakopetria, the Church of Ayios Nicolaostis Stegis, the Kykko Monastery, the Ecclesiastic Museum, the Tomb of Archbishop Makarios III, and Troodos square. Farewell dinner with a panel of Cypriot academics, government officials, members of the security and defense community open to the public.